Give your home a mini face lift on a budget by changing some of the furnishings and furniture, take advantage of the huge savings on offer. Made.com cut out the middleman saving you a bunch of cash! Where do I use my Made.com voucher code? Choose the products you wish to buy and add them to your shopping basket. Go to the shopping basket page by clicking the basket icon in the top right-hand corner of the page. On the shopping basket page below ‘subtotal’, you will find ‘Discount or Gift Voucher? Add it here’. Click the text to reveal a drop-down box. Enter your code into the box and click ‘Redeem’. "By signing up to the Made.com newsletter, you can enjoy a great £10 discount off your first order! Plus you will receive all the latest offers, new products and more." If you’re wanting to spruce up your home, enjoy the superb selection of luxurious and elegant homeware online at Made.com. Reap the benefits of designers goodies without having to pay the hefty price tag at Made.com. Everything you purchase comes straight from the designers themselves, eliminating the extra warehouse and high streets increased prices. Whether you’re looking for a statement coffee table, luxurious rug, elegant sofa, modern lighting or a new Mattress, you can find something you will love with a price which is just as exciting as the Made.com collection. Find something innovative and unique today at Made.com with products sourced from the designers themselves, boasting contemporary style, frivolous colour mixes, smooth materials, practicality, striking lines and curves and much more! Check out the Made.com sale for a wide array of discounts on a range of designer furnishings. What’s more, with the help a Discount Code featured on the NetVoucherCodes website, you can enjoy a superb saving off your next purchase. 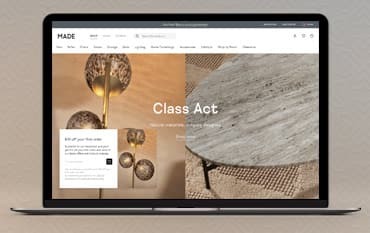 Made.com is the home interior and furniture specialist which boats luxury and contemporary, designer goods which everybody can rely on. Recommended by The Telegraph, GrandDesign, Financial times and other big names in the media, Made.com is one of the most trusted designer furniture online retailers. Awarded as one of the top 50 furniture store, Made.com os one highly recommended store which you can count on. 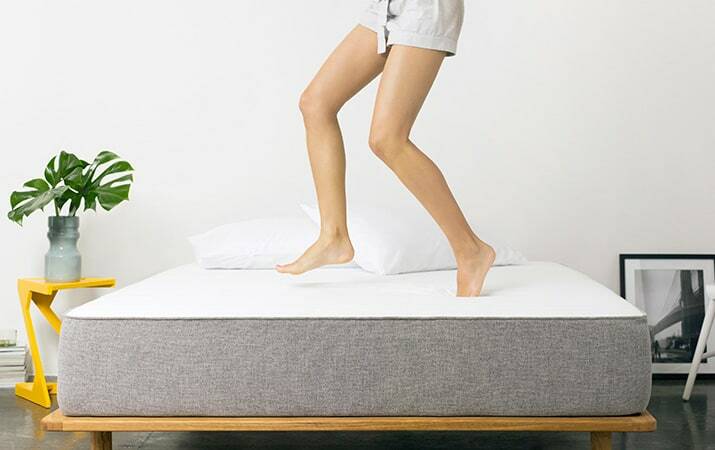 Made.com considers the ONE mattress as the perfect sleep partner and it’s clear to see why. The clever combination of layers makes for the ideal mixture for a perfect night's sleep, combining comfort with intelligence. The contouring memory foam top compliments the breathable latex middle finished with a high-density foam base which allows the ONE mattress to fully adapt to your body. A high-quality, soft-knit fabric cover woven by master craftsmen flexes with the mattress and provides the perfect finishing touch. What’s more, with a money-saving ONE mattress voucher code found at NetVoucherCodes, you could save some extra cash! Where better to find yourself a designer sofa minus the hefty price tag than at Made.com! Kicking back after a long day at work feels 100x better when it’s designer so what are you waiting for? Whether it’s a quiet Friday night in, a busy Saturday afternoon or a Lazy Sunday Morning, you can find a sofa to suit every need, especially with a voucher code to help cut down the costs. Browse through an exciting selection of Sofas, 2 Seaters, Chaises Longues, Armchairs and much more. Your sofa is the focal point of your living space, so it’s important to ensure it’s a good-looker. Delivery prices at Made.com depend on the weight, dimensions and price of the product you’re purchasing. For full Delivery details, click here. If you wish to make a return, you will need to do so within 14 days of delivery. You will need to contact the Made.com customer services by telephone, live chat or email and provide your reference number along with a reason you’re requesting a return. At Made.com, you can expect to find, luxury, designer furniture for just a fraction of the price! Deck out your home with designer goodies, without having to pay the prices you would expect on the high street. What’s more, with a Made.com Voucher Code, you can pick up a range of beautiful furnishings at an even lower price! Enjoy access to luxury goods from the most innovative and unique designers so you can deck your home out for a fabulous price. We are constantly on the hunt for first order Voucher Codes for Made.com to help you with your money saving. Our experts check dozens of sites for secret codes including NHS discounts, student sites & social media channels saving you time & money!